I heard from Jay and from others that the seats on Valves (and regulators) was made from a material that crumbles and even explodes over time. With this valve, if you put a generic k valve kit on it, shouldn't it work, and wouldn't it solve the crappy seat issue? TD, it's the Voit J-valves you need to stay away from. I'm paraphrasing Herman, but part of the valve is made from plastic that crumbles, an that ain't good! The ones that disintegrate/blow apart are the HP seats inside the fist stages of their regulators. I don't know, but I'm wondering if its the same material? Anyway, I think that manifold should be good: the seat in that should always be Teflon?!?!?!? It is the AMF Voit J-valves, the J-reserve on the Titan II-J and Trieste-J that are a problem. I have not heard of the HP seats being a problem in the first stage. The J-valve seat was made of a teflon plastic, I think, which crumbled. That only affected the J-valve portion of the valve/regulator, and not the other components (unless crumbled plastic got in and caused a leak). The funny thing is that I have one of the AMF valves, made black, which uses a different compound for the J-reserve, which is still intact. 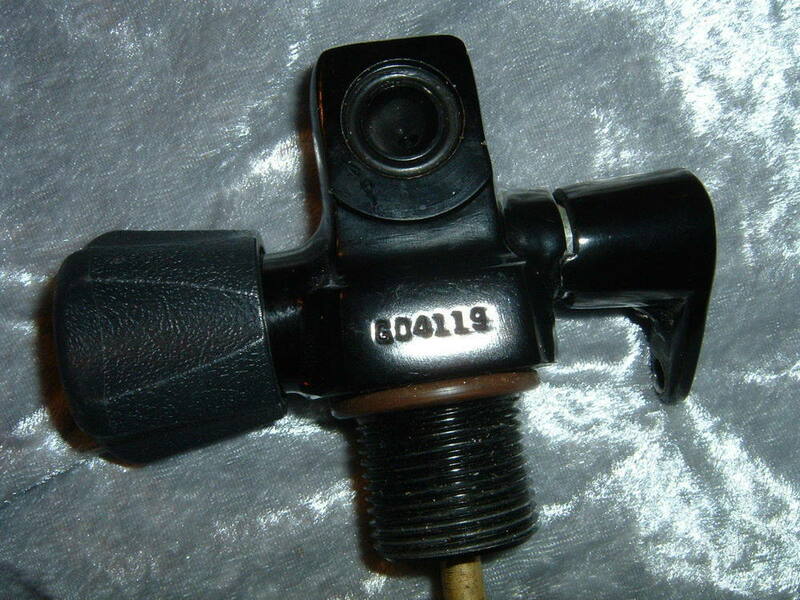 It does not have an AMF Voit identification, but is the same valve, apparently made of aluminum. I'm wondering whether it was made for the U.S. Navy, and was part of a new anti-magnetic system? By the way, the solution is to remove the J-valve and simply use the plug for that area (if you can find a plug). Alternatively, knowing of the malfunction, remove all the plastic and only use the valve as a K-valve, keeping the lever in the reserve position. PS, if this is the valve you are talking about, you don't need to worry. The J-reserve is made of a different compound, and mine is intact. 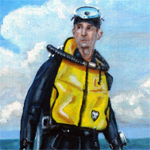 Last Edit: Mar 5, 2019 15:04:20 GMT -8 by SeaRat: Add the PS info. I double checked with my Voit expert and he confirms that while the reserve seats are a problem and should be removed, the main seat is OK and not subject to the ageing damage the reserve seat is. You can't get new, and you can't use NOS parts for the J valve. The NOS ones will break up as did the originals, due to age. A plug and an SPG is the answer. I heard SOMEONE made some nylon or some other plasticky material parts recently, but those were one-offs. IF the person who made them was to make some more, he could probably make millions selling to the 3 people who want them..... If he didn't get sued. For billions. Okay, so to clarify, the seat for my MR12 should be ok, and the J valve seat in the valves as well as in the manifolds are kaput. Isn't there some new seat that you could use, like there are so many valve kits online I'm sure one could work. I know of a place that still sells parts for USD J valve kits. I just haven't had enough time to sufficiently take apart my MR12 and diagnose the problems. If anyone wants to make a trade for a reg, Pm me. Also got a Scuba Pro MKVII up for grabs. Note the difference in the J-reserve modules. 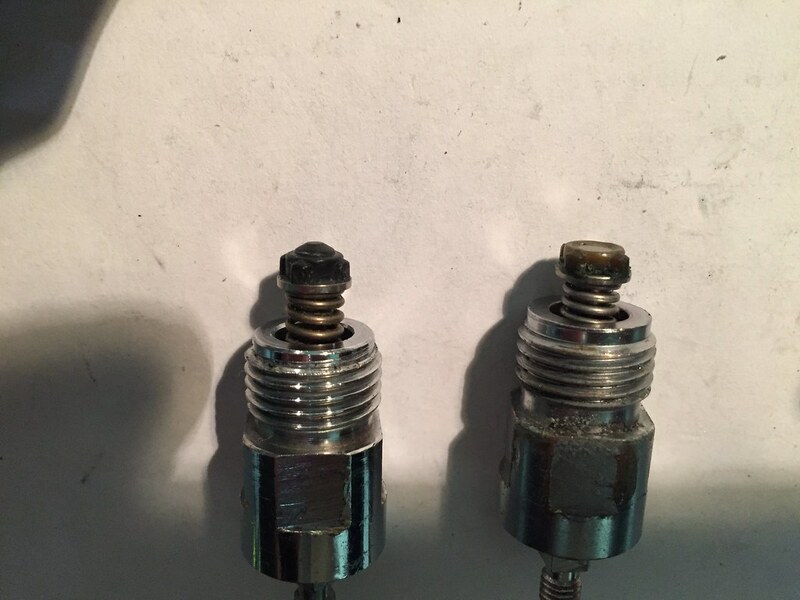 One has deteriorated (the near one, which goes to the chromed AMF Voit valve), and the other has the ball intact (the aluminum black valve). This shows the difference in the two J-reserve modules for each valve. The chromed J-reserve valve (the one on the right) has completely lost the ball shape. It was originally a clear color, as I recall it. The other (on the left) is from the black aluminum valve, and is intact. The material is a black material, but it seems to have held up over the years whereas the other has been lost. You can use the valve without the seal, the AMF Voit chromed version, but know that the J-valve simply won't work right. Air will get through, and it may not give a reserve signal. That's why I said just to use it with the reserve lever down, in the "on reserve" area, and use it as if it were a K-valve. 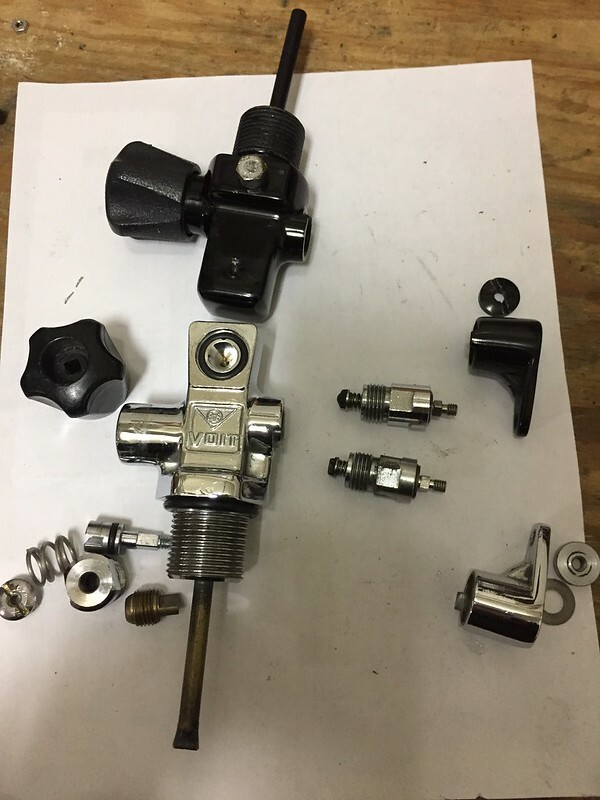 The black aluminum valve probably will work, but if you get it from The Scuba Museum, take it apart when you get it and have a look. True, I got a hand full of NOS Voit reserve seats and every one of them was crunchy. They looked perfect but as soon as you put a little stress on them, they busted up into a bunch of pieces. You can replace it with a plug or just take the reserve apart, remove all the plastic seat material and reinstall the metal parts. You will not have a reserve but you can use the valve. A few years ago someone did make a couple that ended up in the hands of an undisclosed Voit expert for testing, they are still working. Rumor is they were nylon and a real PITA to make. Between being a PITA to make and the liability, not likely any more will be made according to my sources. John, don't count on the black one. The NOS ones I have are black and crunchy. I suppose it could be a very late model or you're just lucky but I wouldn't trust it. John, don't count on the black one. The NOS ones I have are black and crunchy. I suppose it could be a very late model or your just lucky but I wouldn't trust it. There's a reason that neither valve is on a tank. Does this apply to all Voit J valves or is there a certain type, year range, or another way to identify the bad ones. I have a set of Voit twins early 60's vintage. Is there an easy safe way to eliminate the reserve on these. Skip, why don'cha turn it into an SPG port?